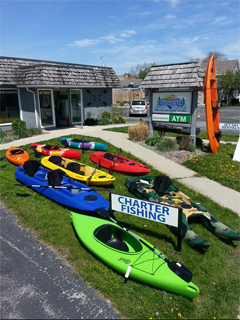 Door Countys only CLEAR BOTTOM KAYAK dealer carrying Kiwi Kayaks, Liquid Shredder paddleboards, snorkels, masks/ fins, boogie boards, wetsuits and a full line of salmon fishing tackle. Also renting kayaks, boards, bikes and more! Open daily at 9am June-Sept. 920.493.3474, www.lakeshore-adventures.com.